Like every year during the month of July, Duanes de la Mar will celebrate the Moors and Christians. This fiesta, filled with history, music and color, commemorate a historical past of struggle and coexistence between two cultures, Muslim and Christian. You will see parades, the landing of the Moors, the feria of Cristianos & Moros, and much more. representatives of the participants who will take part in the presentation. 22:00 h. Official presentation of "Moros I Cristians 2017” in Avenida Jaime I followed by performanceof Trio Acuario until 03:30 h.
00:30 h. Dinner for participants in the Avenida Jaime I. 10:00 h. Playground Multiadventure in Avenida Jaime I. 20:30 h. XIV Festive Music Concert in Sevilla street, offered by the Xabia Artistic Music Center. and flower offering to the niche of the fiesta patron San Jaime in Calle San Jaime. 9:30 h. Table of food collecting in favour of Caritas in the supermarkets Mas y Mas and Coaliment of the Avenida Jaime I, organised by the Junta de Festes de Moros i Cristians. Until 14:00 h.
In this same Act, will be a donation of food to Caritas by the filaes and Junta de Festes. 23:00 h. Fellowship Dinner in Sevilla street with mobile disco until 03:00 h.
22:30 h. Live Music in the Manuel Bordes Valls street until 03:30h. 11:00 h. Parade of Fila Capitana and Junta de Festes, visiting cuartels and kabilas. 19:30 h. Entrance of Musical Bands. 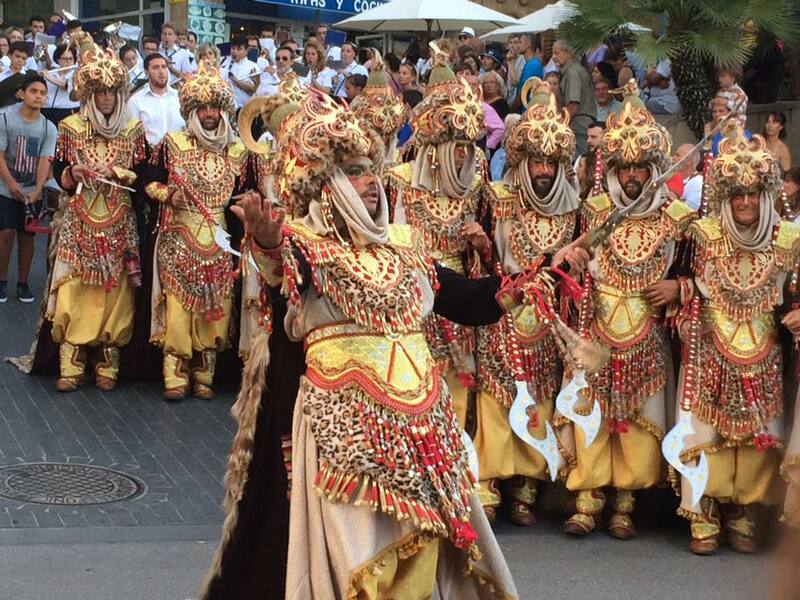 20:30 h. Gala parade of the Moors and Christians Companies. 23:30 h. Mobile Disco "Mora y Cristiana", in Dr. Fleming street until 04:00 h.
10:00 h. Children’s Day with water games in the outdoor area of the Sports Pavilion. 10:30 h. "Chocolatada" offered by Abanderadas in the outdoor area of the Sports Pavilion. involved, refusing to assign responsibility to the organizers of the event. 20:00 h. Gala parade of the Moors and Christians Companies. After that, Fireworks. through the old town to the Placeta del Convent. domestic animals on the port promenade. bull-running around the church square. fortress-church of San Bartolomé in the heart of the historic centre of Xàbia. 2017 the town celebrated 250 years. chapel of Calvario, followed by fireworks. accompanying live music and entertainment. Christian recon quest and finishes with the fantastic gala parades. 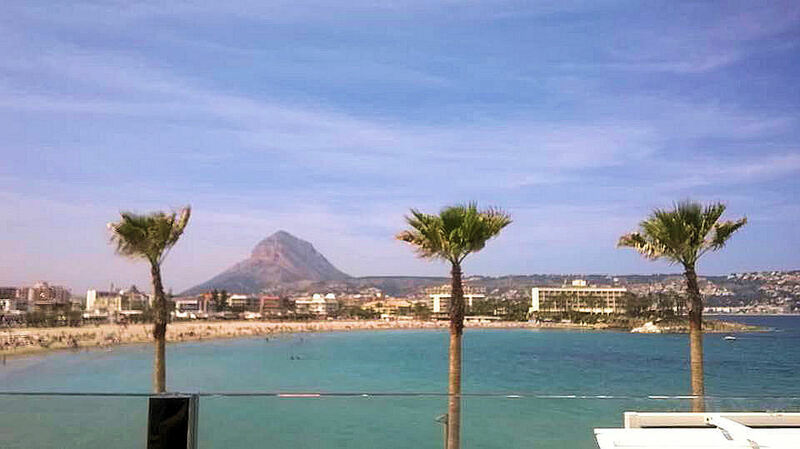 the centre of the bay of Jávea to make the traditional offering of flowers. meals, live music and activities for children. The popular annual international jazz festival in Plaza de la Constitución. community dinner and traditional games. concerts, shows, community dinners, processions and the aquatic fireworks. Déu de Loreto with the solemn procession and the stunning fireworks finale. for a special mass followed by snacks. awards at the Ayuntamiento de Xàbia. Santa Claus may have gone back to the North Pole to rest, but it doesn’t mean the gift-giving (and receiving) is over - For many Christians, the holiday season doesn’t officially end until the 12th day of Christmas known as the "Feast of the Epiphany” or "Three Kings' Day”. In Spain, children and many adults polish and leave their shoes ready for the Kings' presents before they go to bed on the 5th of January. Sweet wine, nibbles, fruit and milk are left for the Kings and their camels. This is similar to children leaving mince pies or cookies and milk out for Santa Claus or Father Christmas. 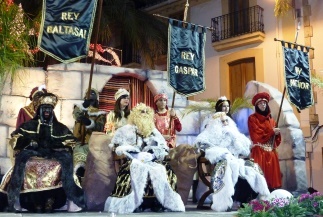 The Three Kings Fiesta is the main celebration of Christmas in Javea. On January 5th the Three Kings arrive in the port of Jávea by fishing trawler to be greeted by local dignitaries, the municipal band and of course hundreds of excited children. A colourful procession winds through the streets of the port to a special stage where their majesties will hand out token presents to the kids who have been waiting patiently in the square. As night falls, the procession climbs up into the old town, the escorts showering excited children with boiled sweets, and arrives at another special stage where more token presents are dished out. The evening has always been a special one in the Christmas calendar when children and adults can expect to receive their presents. up to Plazeta del Convento. The chiringuitos of Spain are an essential part of the beach and holiday atmosphere and they can be found on just about every popular beach in Spain. They normally set up from May through to October. The chiringuitos of Spain have an interesting history dating back to the 1920s. 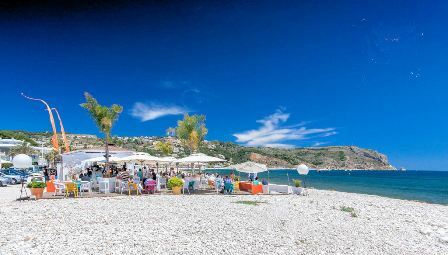 it is widely believed chiringuitos originated in the 1950s when forward thinking fishermen’s wives realised there may be a demand for fresh fish and cold drinks as foreign tourists began to trickle onto the beaches of the fishing villages of Spain. 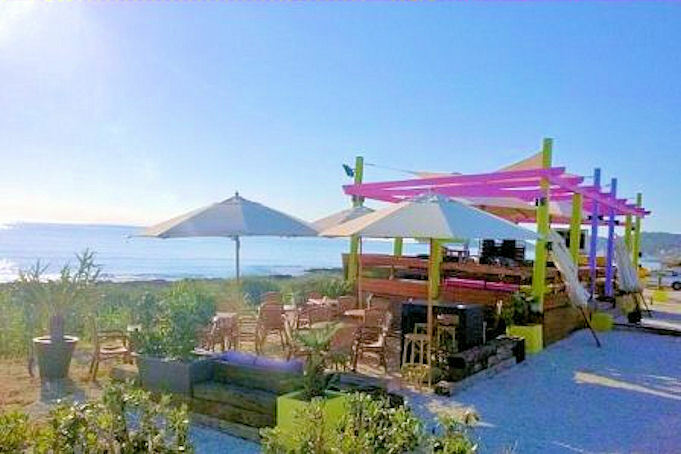 The early day chiringuitos were very often nothing more than an overturned boat used to serve up tapas and drinks. As business increased the shrewdest fishing families decided to build wooden kiosks. Whether you live here all year round or just visit, it is this time of year that we all look forward to that has become a Spanish tradition. Demand from international buyers will remain fundamental necessity to help the Spanish property market continue its recovery and it remains to be seen if Brexit results in a fall in British interest. Overall experts point out that 2016 was a positive year for the real estate market with prices having bottomed out the year before and modest price rises seen in some locations. It is likely that locations with lower prices could become more in demand in 2017 as buyers still want a bargain and there is likely to be some uncertainty around the UK formally beginning the process of leaving the European Union and elections in France and Germany. recovery continued throughout 2016 and price increases moved beyond the big cities such as Barcelona and Madrid and desirable second home destinations. ‘We believe that a growing economy, low financing costs, good potential for rental returns and capital appreciation will continue to drive sales throughout 2017 and beyond,’ he said. But his firm has found that Brexit had a noticeable effect on sales to British buyers in the second half of 2016 but he believes that this was mainly due to the depreciation of the pound rather than concerns about the country’s future in Europe. 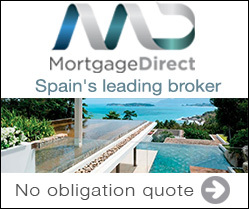 ‘Across Spain as a whole Brits still dominate foreign sales with nearly a fifth of the market share, more than double that of French buyers, he pointed out, adding that diminishing demand for high end homes in London following Brexit could also see non-EU citizens look to Madrid or Barcelona in the forthcoming months. ‘We also expect that demand for Spanish property from other foreign buyers, including from the United States and the Middle East, will continue its upward trend throughout 2017. We’ll see new low cost flights from British Airways and Norwegian Airlines from the US to Barcelona during 2017, a reflection of the growing attraction of cities like Barcelona for Americans, as both a tourist and second home destination,’ he concluded. New homes are expected to be built in Valencia in 2017, signalling that developers think the demand will be there, according to Juan Luis Herrero, a partner with Lucas Fox in the region. ‘Regarding re-sale properties, we forecast a continued upward swing, especially now that the uncertain political situation which prevailed during 2016 has come to an end. The return of mortgage credit and low interest rates will continue to fuel this trend,’ he said. Demand is also expected to rise on the Costa Brava, especially in traditionally sought after coastal villages such as Llafranc, Calella de Palafrugell and Begur. ‘These are the areas where we are likely to see the first increases when prices begin to rise,’ said Tom Maidment, a partner with Lucas Fox Costa Brava. He also expects to see an increase in buyers from the United States but thinks second home buyers from the UK will hold off until there are firm indications of what deals will be done once the UK begins the formal process of leaving the EU which should start with the triggering of Article 50 before the end of March 2017 and the impact this might have on Sterling. Prices could fall further in Marbella as developers reach out to foreign buyers, according to Stephen Lahiri of Lucas Fox’s office in the region. ‘The increase of new projects is leading to increased competition and developers are increasingly focusing on prices and payment terms and value for money,’ he explained. Richard Speigal, head of research at Spanish property portal Kyero, pointed out that house sales in Spain have recorded a 15% rise on the previous year and seen 10 consecutive quarters of growth, which means that the Spanish property market crash has officially ended. ‘Spain’s market has two unusual advantages. Firstly, it had nowhere to go but up. The 2008 crisis completely shredded the housing market. Secondly, Spain has incredible international appeal and with one in five property sales going to foreigners, it can endure weak local demand,’ he said. ‘British, French, German, Dutch, Belgian, Italian and Swedish buyers are picking up the slack, which has been good news for the wider market and for those involved in selling property in Spain,’ he explained. He believes that there is still pent up demand from potential British buyers, citing figures that show that overseas searches for Spanish property via Kyero reached all-time highs after the referendum vote in June, up over 50% on 2015. The portal’s largest agents also reported seeing record attendance at UK investor shows. He predicts that older British home owners with no mortgages on their properties and looking for a holiday home will be tempted to buy in Spain in 2017 and beyond. ‘In short, British buyers age 50 plus who love Spain are sitting on huge equity piles and Brexit didn’t diminish their wealth and as a group, British buyers are getting richer,’ said Speigal. But he warned that they will haggle over prices and will want to get value for their money. ‘The hunt for value will translate to a key trend in the Spanish property market in 2017 with buyers seeking good value properties that offset the drop in Sterling’s value. Evidence is already emerging of the benefits of this on lower priced destinations, which look set to boom in 2017,’ he added. Hi top tips for 2017 include Almeria where traditional charm attracts overseas buyers. In the third quarter of 2016 sales were up year on year by 93% and with an average price of €129,000 properties are seen as good value, almost half the cost of the national average on the portal. Prices are also lower on average in Alicante where international buyers have more property than any other province in Spain. While this could make it susceptible to shocks, Speigal says it’s strengths are hard to beat including fabulous beaches, steady sales growth and prices up to 15% below average. Tenerife is also on the spotlight as far as overseas buyers are concerned with Italian buyers overtaking British buyers for the first time as the main group of international buyers. Prices are already increasing, up 5% to an average of €249,000 in 2016 and low cost flights from around Europe make it popular with those looking for a holiday home that they can also let out.